WHAT WE HAVE THAT OTHER CONDOS DO NOT HAVE!!!!!!!!!!!!!! 1) IT TAKES 1 MINUTE AND 20 SECONDS TO WALK FROM OUR FIRST FLOOR FRONT DOOR TO THE BEACH. IT TAKES ONLY 20 SECONDS TO WALK TO YOUR CAR PARKED UNDER OUR CONDO. YOU CAN'T FIND CLOSER ACCESS TO "BOTH" ANYWHERE ELSE IN MYRTLE BEACH!!!! 2) WE HAVE REMOVED THE POPCORN CEILING IN ALL ROOMS INCLUDING CLOSETS AND LAUNDRY ROOM. THE CONDO LOOKS MUCH NEATER, BRIGHTER AND LARGER. THE ENTIRE CONDO IS PAINTED IN ULTRA BRIGHT WHITE. 3) WE HAVE 4 TELEVISIONS - 3 TVS (ONE IN EACH BEDROOM) AND 1 LARGE TV IN LIVING ROOM. ALL LED. 4) WE HAVE FREE WI FI, FREE LANDLINE PHONE WITH FREE CANADIAN CALLS. A LOT OF CONDOS HAVE HAD THEM REMOVED. WHAT IF SOMEONE WANTED TO CALL 911??? 5) WE HAVE REMODELED MASTER BEDROOM BATH TO INCLUDE WALK IN FLOOR TO CEILING TILE WITH A $1052 GLASS DOOR TO SHOWER. 6) WE HAVE REPLACED ALL FLUSH DOORS WITH UPGRADED RAISED PANEL DOORS. 7) WE HAVE 4 CUSHIONED ROCKER & SWIVEL LOUNGE CHAIRS AND LARGE EATING TABLE ON SCREENED PORCH. NOT CHEAP PLASTIC OR $19.95 CHAIRS. 8) WE HAVE FULL SIZE WASHER AND DRYER. 9) WE HAVE A STAINLESS STEEL AND GLASS COMPACT REFRIGERATOR IN OUR WET BAR AREA. Shore Drive is a very popular family oriented destination. Shore Drive is a dead-end street with no flow-through traffic. 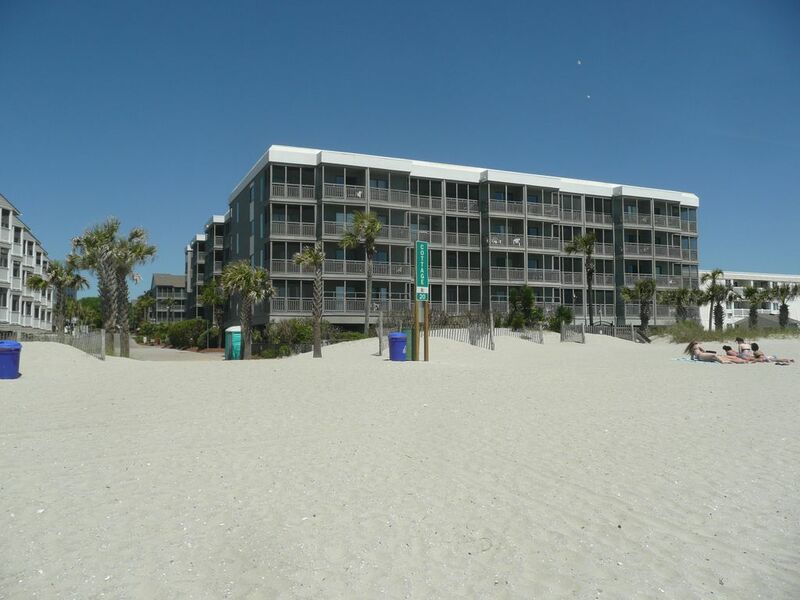 Our ocean side condo is on the first floor with convenient access to the beach and covered parking deck. Our condo is furnished and has ultra bright white colors and is freshly painted. The living room chairs and sofa are upholstered for your comfort. The dining room table seats six comfortably and there are two bar stools at the bar/counter top. No Pets Allowed. GREAT LOCATION!! Pelican's Landing is conveniently located between Myrtle Beach and North Myrtle Beach near the new Hwy 22 to Conway & the Hwy 31 Bypass. We are between Barefoot Landing and Broadway at the Beach - the two largest family attractions. Several of the 85 golf courses are nearby. Within our neighborhood, you can access 24/7 Super Wal Mart, 24/7 Kroger Grocery, Tanger Outlet center, Arcadian Golf Course, 2001 Nightclub, and Restaurant Row while avoiding Highway 17 business traffic. You can walk on the beach a short distance south from our condo to Ocean Annie's Beach Club and enjoy their popular oceanfront bar and band and 2 restaurants. Or, you can walk a short distance north to the Apache Fishing Pier which is the longest wooden fishing pier on the south eastern coast. In addition to walking on the pier or fishing, your children can play games at their arcade. There is also a nice ocean front restaurant there. We have owned this condo since new -- 36 years ago. Our adult children grew up with vacations here and now their children are reaping the benefits today as well. Now we enjoy our vacations with our children and grandchildren. We are retired and enjoy family get-togethers, traveling and visiting our two other vacation properties (Aberdeen Country Club, Longs, SC and Jefferson Landing Club, Jefferson, NC off the Blue Ridge parkway in the mountains. I am also an avid golfer. Good reason to have these destinations. We bought Pelican's Landing because it is on a dead end street with no flow through traffic. It is situated directly in the center of the Grand Strand halfway between all major tourist sites and destinations. It has 3 bedrooms and 2.5 baths so that you can bring grandma, grandpa, mom, dad and the kids. The entire neighborhood is well kept with no dilapidated buildings. You can access a Kroger 24/7 grocery store and a Wal Mart supercenter 24/7 without having to get on the highly traveled business highway 17. Our building is ocean front but our condo is not facing the ocean -- it is on the side of the building with limited ocean views and this is why it is called oceanside. A limited view of the ocean from bedroom on the north side and a view of the ocean from the master bedroom balcony on the south side of the building. We are on the first floor with a very short walk to the beach. It takes 1 minute and 20 seconds to walk to the beach from our front door. It takes about 20 seconds to get to your car. You can park your car directly beneath the condo and walk up the steps directly to our unit. As opposed to parking a half mile away and taking an elevator to the 12 floor when the kids are through playing with it. Can you imagine carrying your luggage, groceries and beach stuff these distances? A quarter of a mile walk north is the longest wooden fishing pier in the south east. Four properties south of us is Ocean Annies, an outdoor bar and band on the beach for you adults. Also, there are two ocean front restaurants at the same location. Across the street is a convenience store, shops, restaurants and FLIP FLOP'S BAR. Our condo complex has a low density population. It is a four story building (not a 25 story). You can actually find a vacant chaise lounge by the oceanfront pool or second pool across the street and have some elbow room by the pool and on the beach. The ease of use and the close proximity of the amenities are understated benefits for our condo..
We just returned from our week and had a fabulous stay for the 2nd year in a row. Condo very clean, excellent location and had everything we needed for the week! Many things in room(kitchen supplies, etc)-basically only needed to bring groceries. Very clean, well maintained unit! Would definitely stay here again. Large selection of restaurants, shopping centers and activities near by. Thank you for the 5 star review. We try very hard to keep our condo clean and updated and full of essentials. Shore Dr. is an excellent area to stay due to the vast amount of restaurants, Tanger outlet stores, walmart and activities. A very family friendly area in Myrtle Beach. Hope you return in the future. We have many repeat guests. Great week. Rain didn’t stop us from having fun. My husband and I had the best vacation. The condo was by far the nicest and cleanest condo we have ever stayed in at Myrtle Beach the owners were great. They take very god care of their condo. We will definitely stay here again. Thank you Brian and Candace for a great week. See you next year! Loved the size of the condo. Plenty of room. Very short walk from the front door to the beach. A great location that’s close to Walmart, Tanger Outlets, and plenty of great restaurants!! Would definitely stay again!! Clean, safe, convenient and well-appointed condo! Loved this condo for a week at the beach! Convenience: The distance between the condo building and the beach is about as short as I have ever seen! Great to have the car parked right below the condo in covered parking! The pool is located beachside! Clean: What a clean condo!! (Very important to me.) And very well-appointed. (Loved the nice touches such as the vintage-looking, oscillating table fans in each bedroom--very beachy.... I used mine every night!) The outside of the condo building and the grounds/pool area are well-maintained. Owners: Loved working directly with Brian, the owner, via email. He answered questions promptly both before and after our stay and seemed to genuinely care. It felt like I was renting directly from the owner and not a company. Was planning to rent at North Myrtle Beach. This property is right on the edge of North Myrtle Beach. Loved the location....very convenient to everything we wanted and more convenient than had we stayed at North Myrtle Beach! The road on which the condo sits actually turns into a dead end, so this decreases the road traffic flow. Family-friendly area! I definitely recommend this condo! Great place to stay. Loved the twin beds for my kids. Definitely would stay again. Google address for directions: 9580 Shore Drive, Myrtle Beach, SC 29572 We are located directly in the middle of Myrtle Beach and North Myrtle Beach. We are centrally located to everything. Restaurant row is at the end of our street. We are between the 2 biggest destinations: Barefoot Landing and Broadway at the Beach. It can't get any better. FREE!!! For all stays- Four night minimum stays FREE!!! Linens & Towels for eight people (OTHERS CHARGE $75) FREE!!! Departure cleaning (OTHERS CHARGE $125) FREE!!! Wifi & long-distance in US FREE!!! Discount fees(2.5%) paid by owner for MasterCard-VISA-Discover charge cards Must be 25 years old to rent. No smoking, pets, motorcycles, trailers, 2 car limit. Saturday to Saturday rentals 7 night minimums only May 26 to August 31, 2018. CHECK IN: 3PM CHECK OUT: 11AM CHECK IN PROCESS IS AS EASY AS IT GETS: BEFORE YOU ARRIVE WE WILL GIVE YOU A 4 DIGIT CODE TO PUT IN A KEY LOCK BOX WITH 2 KEYS MOUNTED TO THE LEFT OF THE FRONT DOOR. EACH KEY UNLOCKS THE DEAD BOLT AND REGULAR LOCKS ON THE FRONT DOOR AND THE LAUNDRY ROOM ON THE PORCH. ENTER THE CONDO AND GO TO THE END OF THE KITCHEN COUNTER AND YOU WILL FIND PARKING PERMITS FOR 2 CARS. PLEASE PLACE THESE ON THE REAR VIEW MIRROR OR IN PLAIN SIGHT ON YOU DASH. BY ALL MEANS, PLEASE RETURN KEYS AND PARKING PERMITS TO THE KEY LOCK BOX AND KITCHEN COUNTER SO THAT INCOMING GUESTS CAN OBTAIN THEM. There is a 3 ring binder with additional instructions that will help you enjoy your stay. Please read. It is usually found inside the TV console.